We made it to day five! 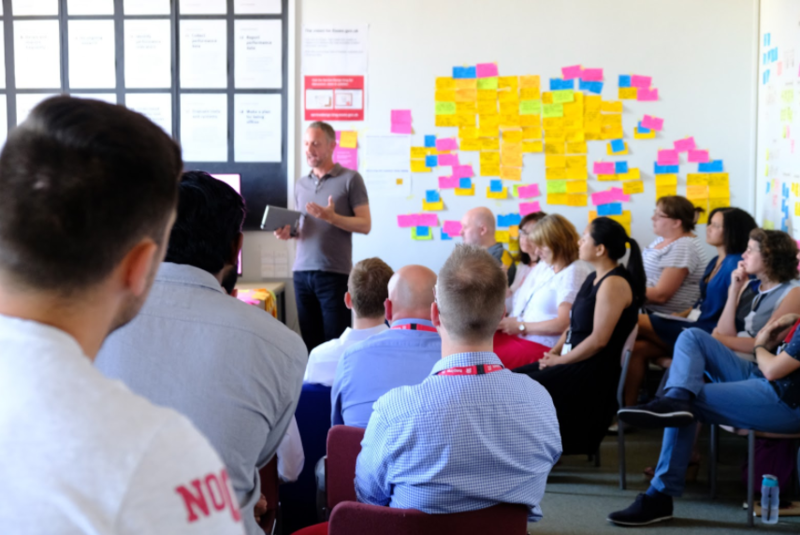 After our final stand up the team shared their experiences from yesterday of prototyping with Essex residents and thought about what they’d want to do next to further test their ideas. 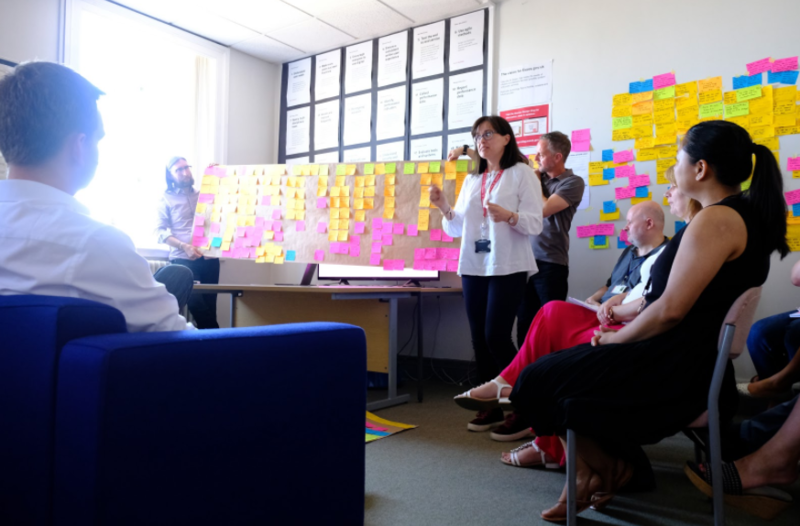 We spent the morning reviewing the progress we made through the week, reflecting on the learnings we took from each method across the process. The Futures Academy is about giving our colleagues the time and space to experiment with different ways of working so reflection is a core part of that learning. We then ended what has been a great week by holding a Show and Tell with colleagues from across Corporate Development. Thanks to everyone who came! All the team did a fantastic job of showcasing the work they’ve done over the last five days and sharing their experience of being part of a multidisciplinary team. 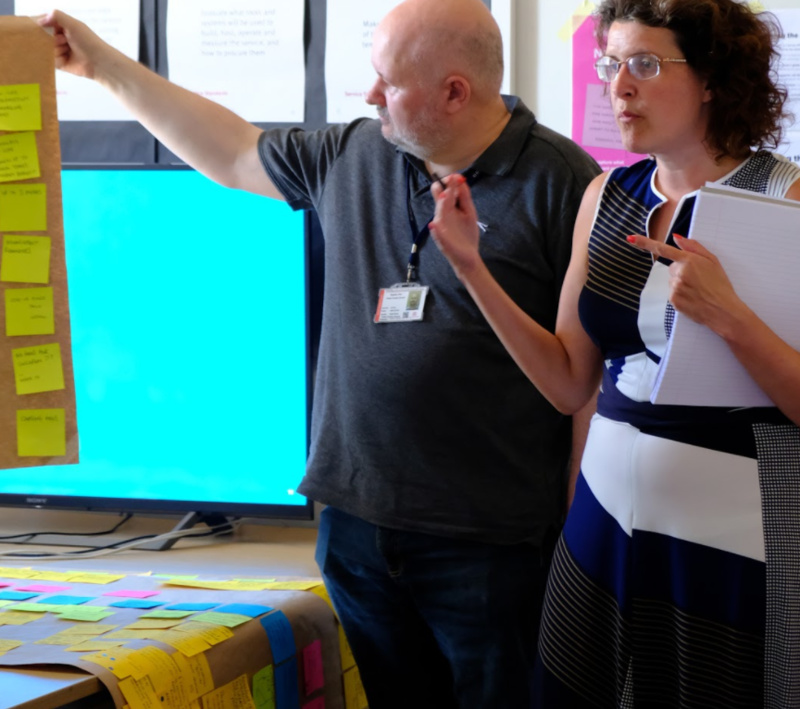 We didn’t have lots of time to prepare a presentation so while Belen and Ian prepared slides, the team decided who would talk about what, and we agreed to show several of the artefacts and prototypes we’d prepared. We were so absorbed in the material, it was quite easy for everyone to talk very naturally about it. Working as a multidisciplinary team was valuable in such a rapid process. Many times we gave each person three stickers to choose the key ideas we were focusing on for the next stages and, as Maria said: “9 people voting meant we didn’t leave valuable things behind.” The diversity of the team ensured we were progressing by involving a variety of perspectives. 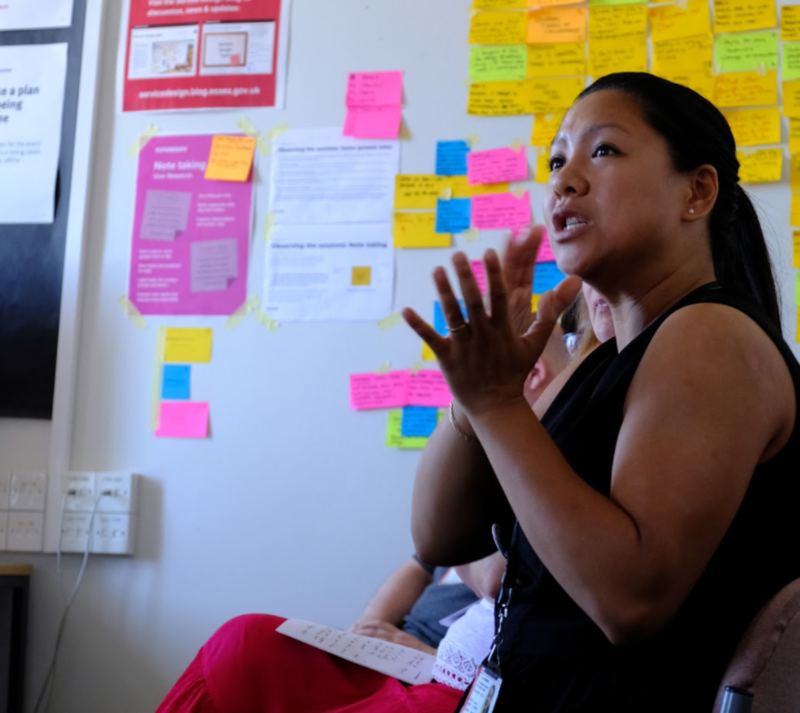 We tried many methods as a team as Nicole reflected, “It was a safe way of practicing before going out and speaking to users”. The team will be able to continue practicing the methods and skills they have learned in their following project. As a whole, it became apparent that we need patience to do thorough steps such as analysis. Likewise, the team reflected on what we will do differently in the next stages. “Next time we’d want to baseline with more data to understand the value of focusing on a particular opportunity in order to define our problem statement.” says Nic. To that, Le wanted to ensure “We always refer back to the problem statement” in the next stages. Some of the discussion after the presentation centred around what characteristics helped make the process work: giving people a safe space to work; support from their colleagues and management and having meaningful retrospectives regularly to check in with how everyone was feeling were highlighted by some of the team members. There were some great questions and lots of interest in what will happen next with the Futures Academy and what this means for how teams are currently working. “I need to trust the process” kept resonating through our retrospectives and became “I trust the process” by the end of the week. Now, it’s on the hands of the team to take the next challenge into their hands. This is just the start. This team now has 8 weeks to take the work forward. We’ll be working in a similarly focussed way, but working on the project 2 days a week alongside our business as usual roles. We intend for the techniques and ways of working to carry over across the organisation. I found this fascinating. I wish you well with the rest of the process. Thanks Louise, we'll be posting regular updates and the things we're learning here.